Sicily is also known for fishing and they export sardines and tuna and Sicily has lots of fishing ports. To name just a few of its important ports: Messina, Mazara del Vallo or Augusta. Sicily is really one of the best places to go for spear-fishing. 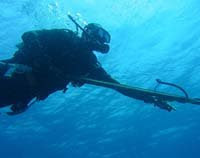 It’s one of the most popular attractions of Sicily and many come here to go spear-fishing but spear-fishing is not for the amateur swimmers and divers. In Sicily, in order to spearfish you need to dive down and pursue these big fish such as the delicious tuna that’s the favourite creature to spearfish here. Unfortunately, with the growing interest in spearfishing and other forms of fishing, the fish population in Sicily is declining. Spear-fishing is fun and can be very addictive but you must know that this is also a dangerous sport. Yeah, fishing is really exciting especially when there’s danger behind it but you got to be cautious as the danger here is definitely real. Barracudas abound and they can kill you if you’re not careful. Just as what they say, if you get to spear-fish successfully here, you definitely deserve your catch.